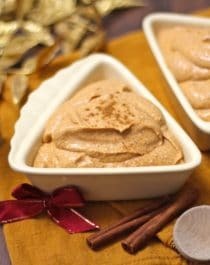 “Pumpkin Pie” and “Cheesecake” certainly don’t come to mind when you are thinking of a healthy snack, but sure enough, this sweet, thick, rich, and creamy Pumpkin Pie Cheesecake Dip is… actually good for you! Oh yes. No full-fat cream cheese, no butter, no eggs and no refined powdered sugar here. This guilt-free recipe is low calorie, low fat, sugar free, and high protein, but you’d never know it. 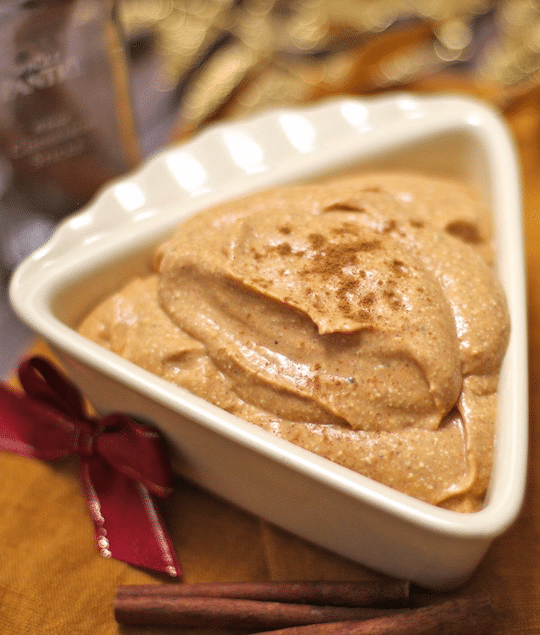 This Healthy Pumpkin Pie Cheesecake Dip is a breeze to make! This sweet, thick, rich, and creamy Pumpkin Pie Cheesecake Dip is made without the cream cheese, butter, eggs and refined sugar. Oh yes, this guilt-free recipe is low calorie, low fat, sugar free, and high protein too, but you'd NEVER know it! Place all the ingredients in a blender or food processor and puree until very smooth. Refrigerate for later or serve immediately alongside graham crackers, gingersnaps, gingerbread, fruit, spoons, etc! Want to see how it stacks up to the Taste of Home’s Pumpkin Pie Dip? A ⅓ cup serving of Taste of Home’s Pumpkin Pie Dip has 165 calories, 7.5g fat, 18g sugar, and only 2g protein. CRAZINESS. For the same amount of dip, my healthified recipe can save you 100 calories, 6g fat, and 16g sugar (thats 4 teaspoons of sugar in a single sitting). Hmmm, I’ll choose my recipe thank you very much. Super easy, amazingly quick, incredibly rich and flavorful, and surprisingly healthy — now isn’t that something we all wanna hear? Talk about a healthy, guilt-free dip! I’d dip graham crackers and Biscoff cookies! It’d be like a one bite pumpkin pie! I have a question. Why are these so high in sodium? Recipe #1 is higher and has no added salt, #2 is 10 mg less with added salt? Are you sure you’ve done nutrition correctly? 770 mg/ 23% sodium is really high for something that has no added salt. That’s why I didn’t add any salt to the recipe! I just made this and it is so good! I know I’m a title late in the game, but I just found your blog and I’m working through your recipes. I made the birthday cake dip the other day and it was great too!